​crafts people in Walton County. Our vision is to be the premier arts organization in Walton County and the platform for all things in the visual arts. MWCA is Walton County's community-based arts center, offering experiences that transform individuals and our municipalities through the arts. Built in 1931, 205 South Broad Street was originally the Monroe Post office. Like all almost 80 year-old buildings, she has encountered some age and wear but we have a plan to make this beauty younger and spunkier than ever! Click below to read about our renovation plans and how you can contribute. building the Monroe Post Office, 1931. Photo from the Monroe Museum. You can watch a fascinating video, Born of Storm, about the founding of Monroe Art Guild here. This video was produced by our members, Mary Ellen and Dennis Vogel and features interviews of many of our founders, plus historic photographs. Walton County was established in 1818, with Monroe being founded not long after, in 1820. For many years, Monroe was an insignificant village with only three or four small stores and three mail deliveries a week. By the 1930's Monroe had grown into a town of 3,300 people and was an area of much commerce and activity. Our building was built in 1931 as a part of the Hoover Administration's Public Works Projects and served Monroe as a United States Post Office from 1932 until 1970. In 1972, the building re-opened to serve as our community's library. In 1993, a downburst caused extensive damage to our downtown area. Mayor Harry Knight began organizing events to celebrate Monroe surviving the downburst. He approached local artist Susan T. Pelham to put together an art show at the McDaniel-Tichenor House and garden. She was able to gather over 20 entries and with fellow artist Bill Barnes produced the first community-wide art show in Monroe. They were amazed at the level of interest and the number of local artists. Susan and Bill received permission from Mayor Knight to use the former library, which was sitting empty, as an art center. With the enthusiastic help of community leaders, volunteers and artists, fundraising and renovation efforts began. Because of the destructive downburst, many downtown buildings never looked the same, but with the work of these dedicated individuals, the historic post office was revived to its former beauty. The lovely building showcases original marble surfaces and secret "surveillance rooms" that Federal Postal Inspectors used to keep an eye on the staff! Based on the community support, Susan and Bill decided to form an art guild. The Monroe Art Guild was incorporated on October 1, 1993. 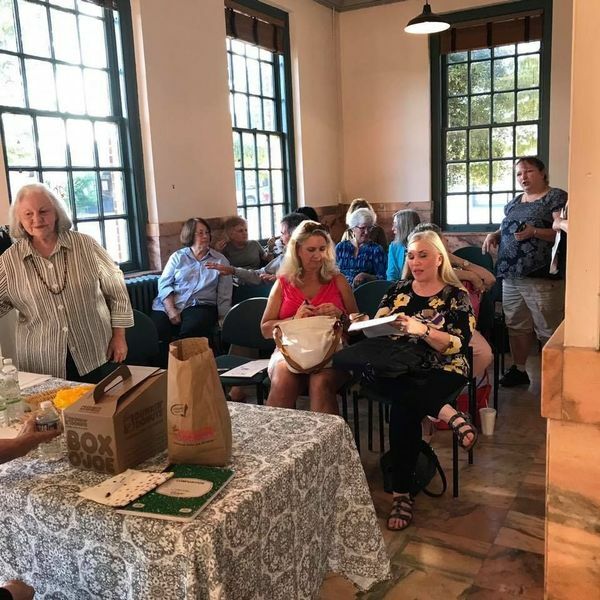 The Monroe Art Guild served the community for many years by providing art exhibits of both local and nationally renowned artists, classes, demonstrations, and a strong community for artists and art lovers alike. Our Board of Directors voted in 2017 to change the name to the Monroe-Walton Center for the Arts with the goal of expanding our outreach to all of Walton County by offering services to and creating an uplifting creative community for children, young adults, families, creative businesses, craftsmen, artists, and art lovers of all kinds. The Artists' Guild lives on as an important committee at the core of all we do. As the new Monroe-Walton Center for the Arts, we continue to uphold the Guild's original mission to make art accessible to our local community. ​Join MWCA today to be a part of this exciting movement in our beloved Walton County! ​and for making Walton County a beautiful and enjoyable place to live.